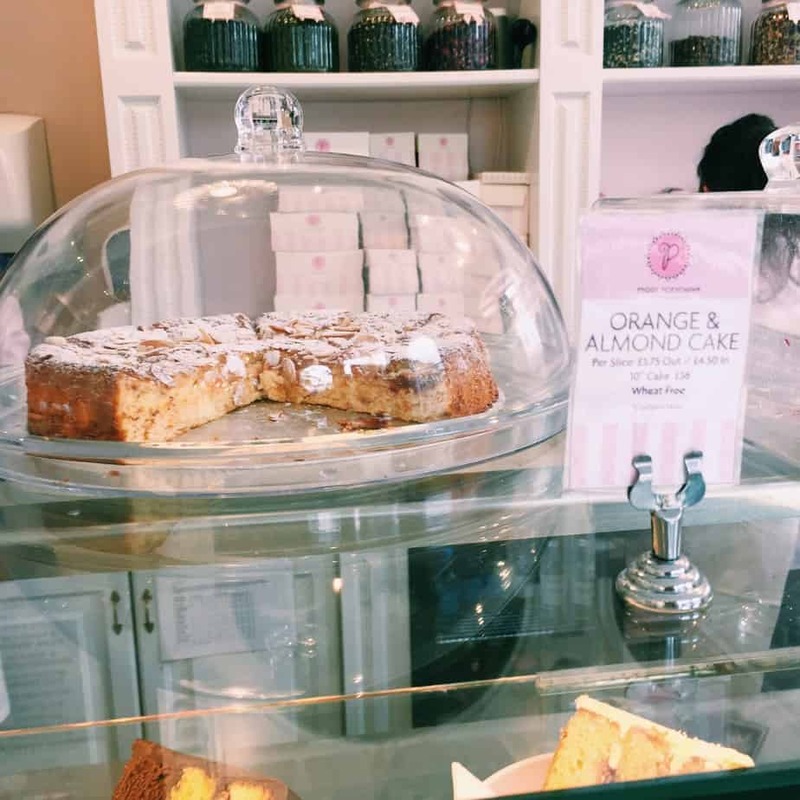 Last week I investigated London’s pinkest bakery by testing out the Peggy Porschen gluten free options. And, like a good blogger, I’m here to report. As you might have seen on my instagram, things got very pink during said investigation. 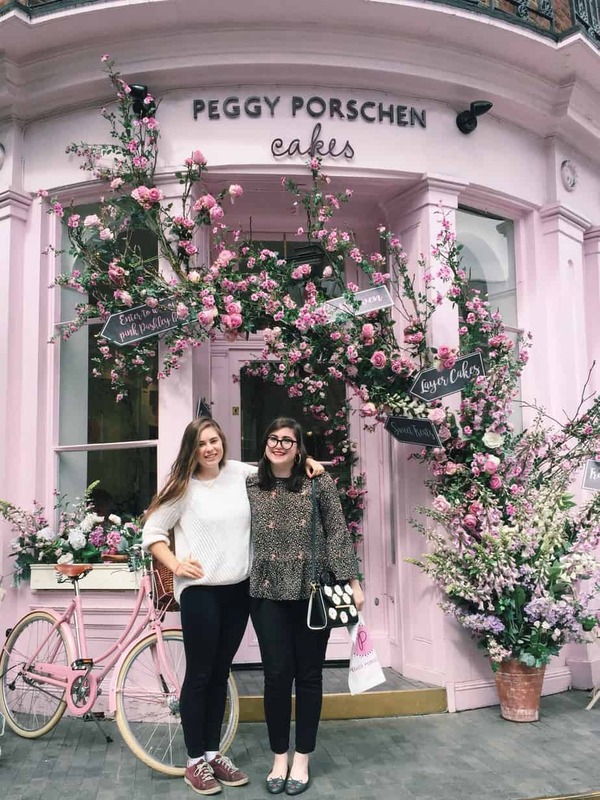 In fact, we pretty much went to Peggy Porschen for the pink-ness, rather than for the baked goods. But a sugary treat here and there doesn’t hurt! 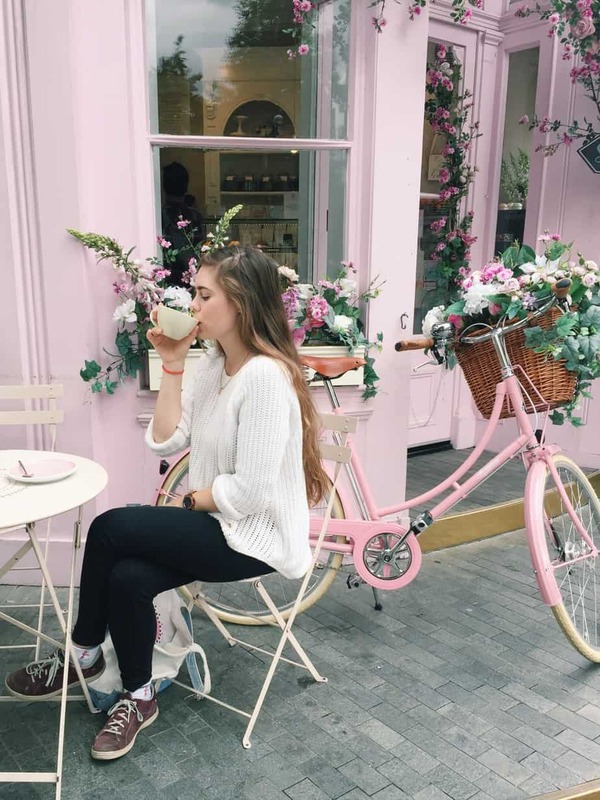 First off, I was in London for just three days on a well-deserved respite. I had just delivered an hour long presentation and debate as an oral defense of my Master’s and I needed a few days off. Luckily, my best friend from college happened to be in London with her lovely parents at the perfect time, so I popped up to pay a visit! I was truly spoiled (hashtag we got to see Andrew Garfield and Nathan Lane almost bowled Julia over, separate story…) and you can probably expect another post all about the trip. 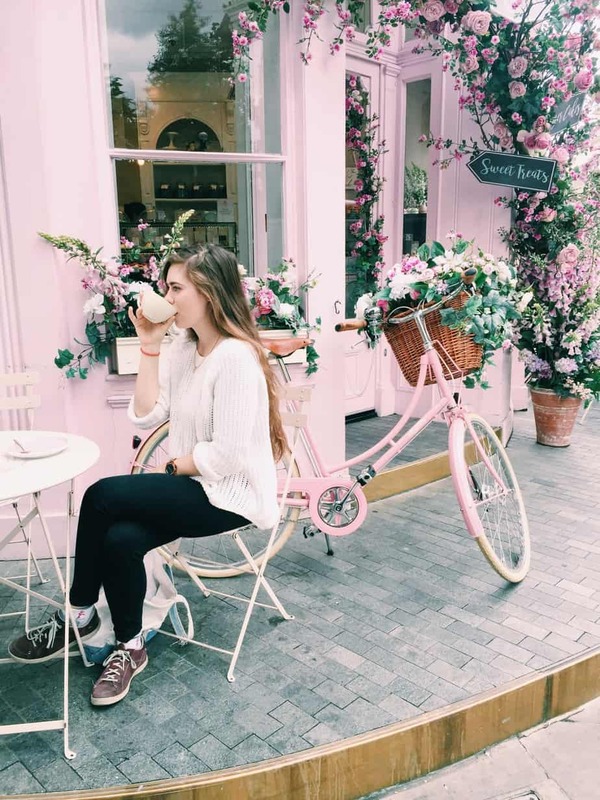 But on my last morning, we popped in a cab after breakfast and made our way over to Peggy Porschen! 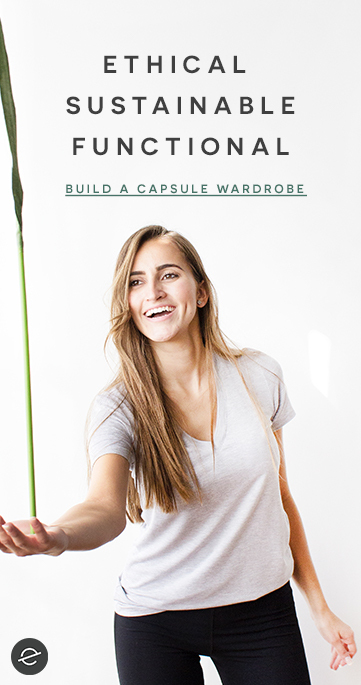 Julia is also a blogger (in fact, she is the original blogger in my life – her blog convinced me to start my own!) 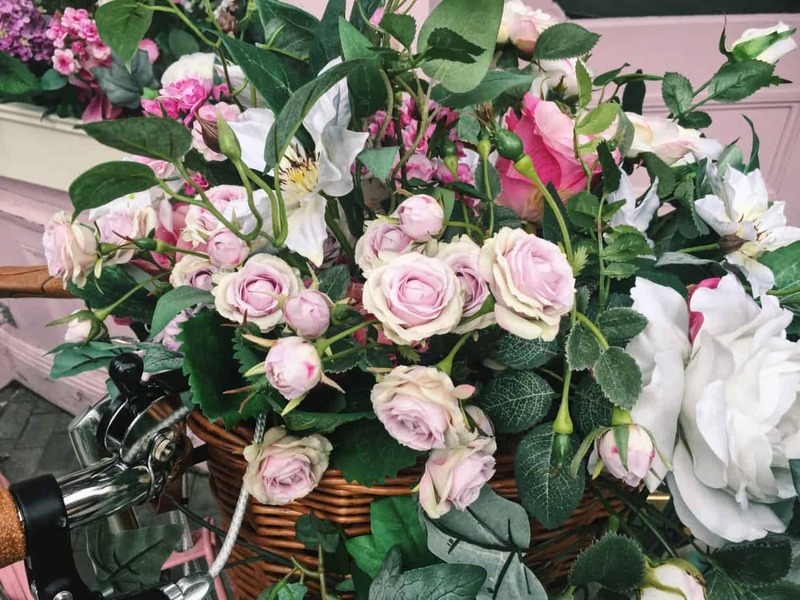 and when she suggested Peggy Porschen I was right on board. 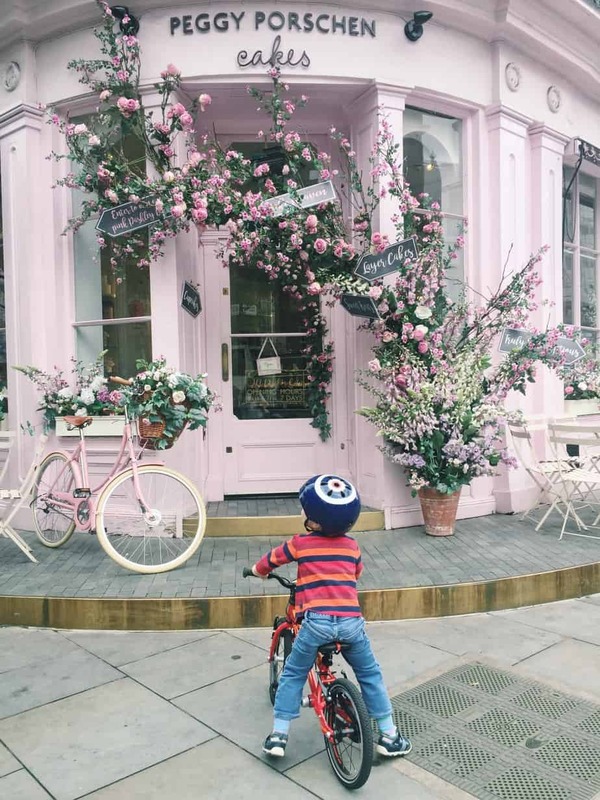 Being the pinkest bakery in London, Peggy Porschen is a bit of an instagram sensation and we wanted to see if it lived up to the expectations. 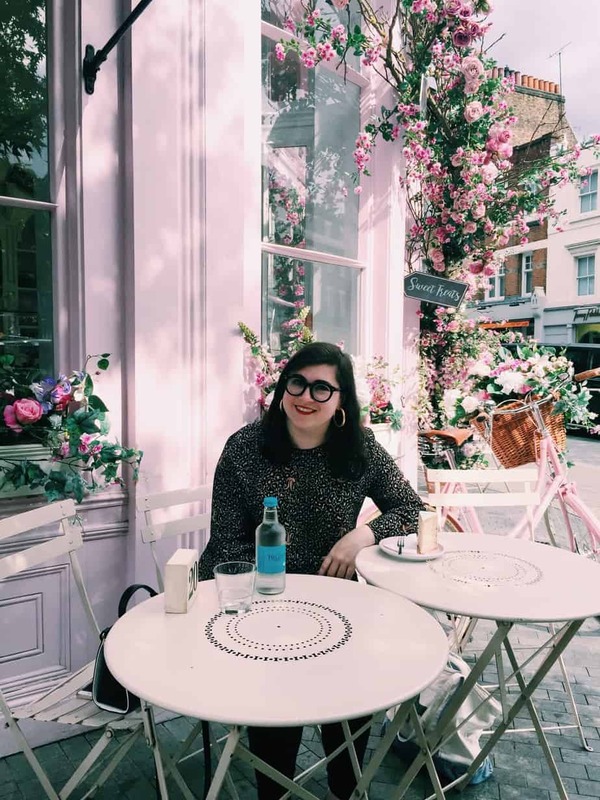 Julia – the blogger herself! 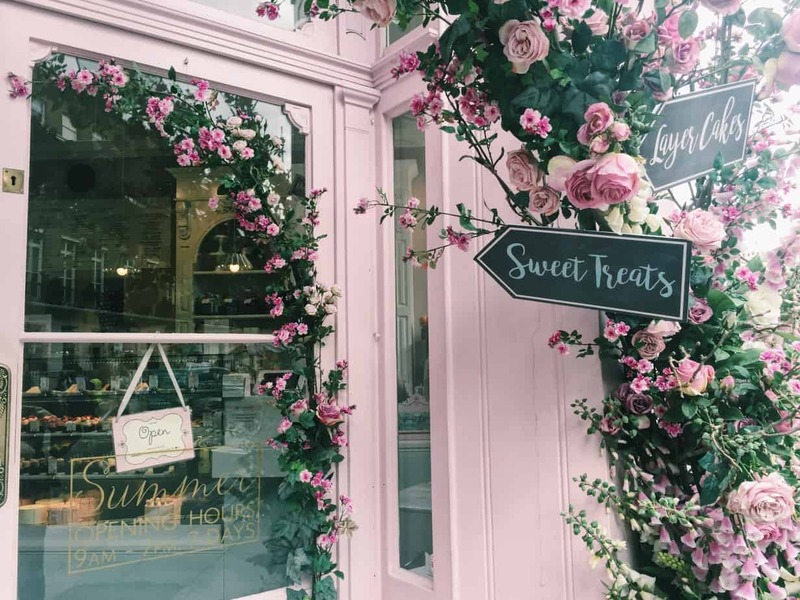 And of course, being gluten free, I also wanted to investigate the Peggy Porschen gluten free options as I couldn’t find any information on the internet about it! 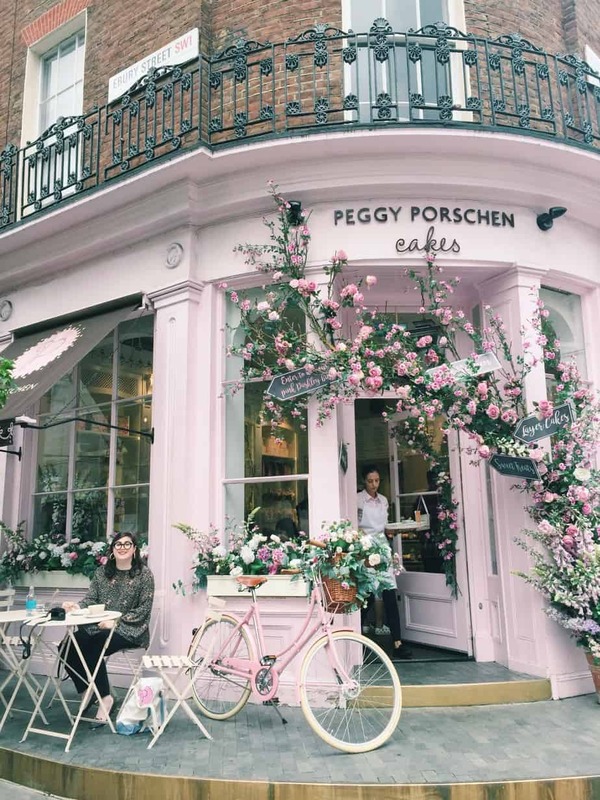 Well, long story short, there ARE gluten free options at Peggy Porschen! Celiacs and gluten intolerants rejoice! 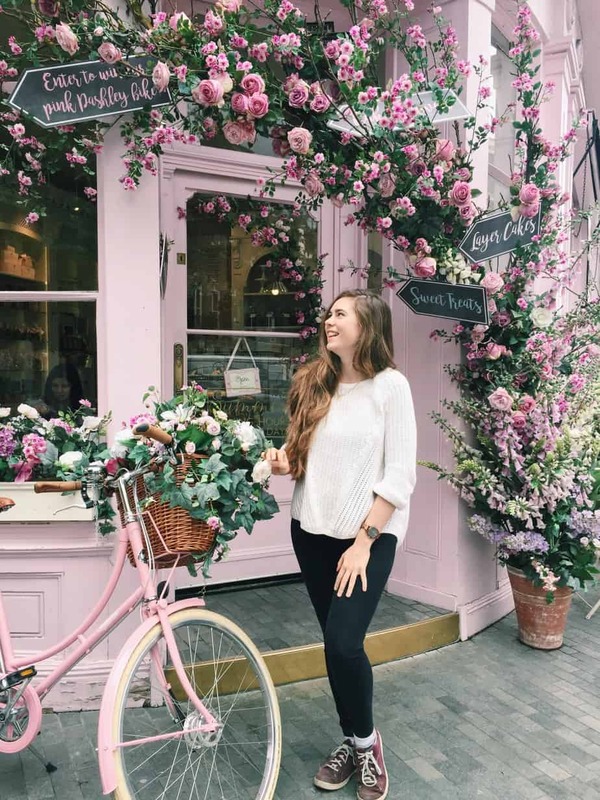 However, there are no gluten free cupcakes, and cupcakes are really what Peggy Porschen is famous for. 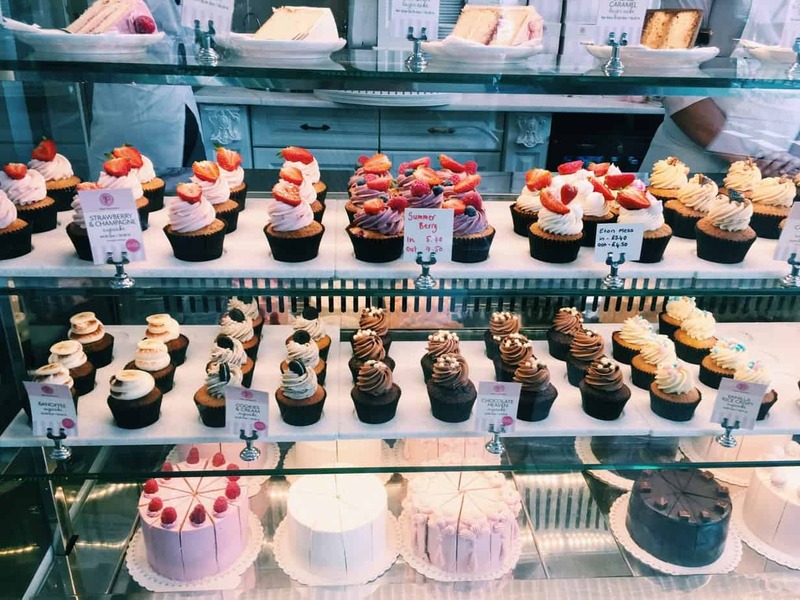 That is definitely a bummer, and if the Peggy Porschen chef happens to be reading this, consider it my personal petition to make gluten free cupcakes! However, they did have two separate cakes on offer (one chocolate fudge, the other almond and apricot I believe). Both looked delectable, and were the typical sort of gluten free cakes you would find at a bakery as they are naturally gluten free (almond flour and all that). There were also macarons in the display case but I was informed that they contain a “small amount” of flour which obviously didn’t fly, although I guess depending on the severity of your gluten free-ness you may risk it. I was a bit bummed as usually macarons are gluten free and these looked particularly yummy. 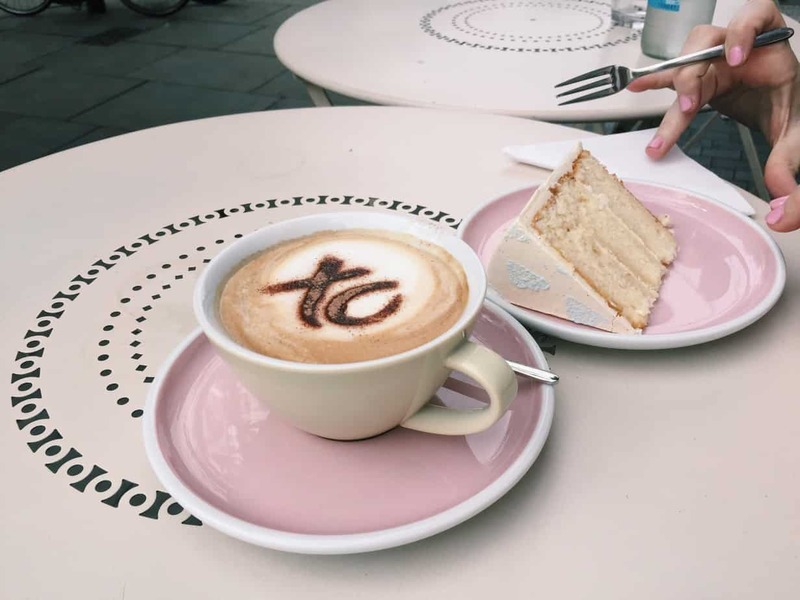 Peggy Porschen also serves coffees which was exactly what I needed at 10am (hey, I was on vacation so that counts as early…). Julia ordered a cake which looked beautiful and I definitely experienced some #glutenenvy. 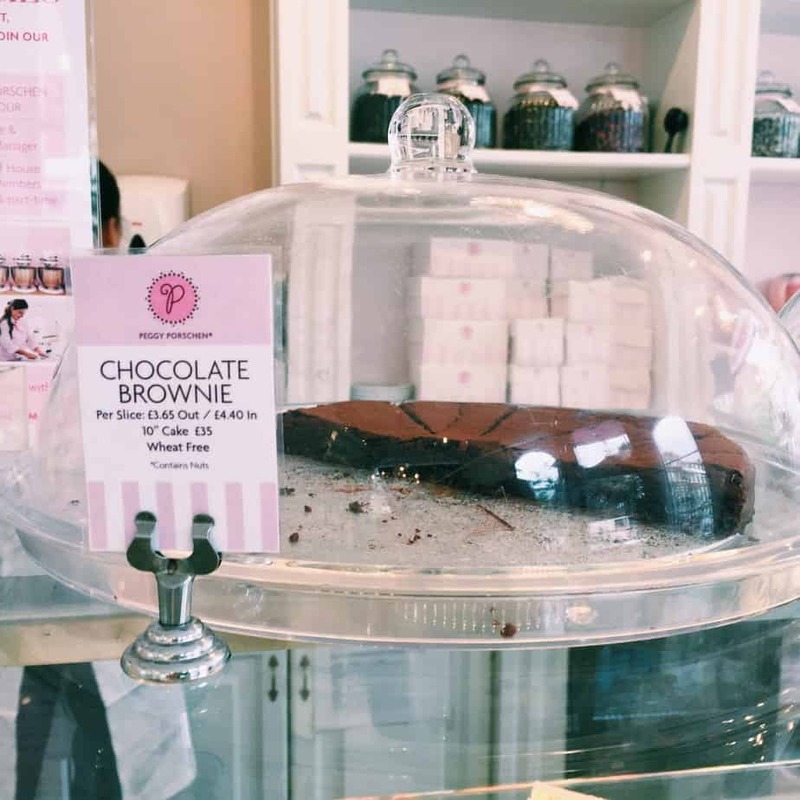 So the Peggy Porschen gluten free options aren’t boundless but they definitely exist! You won’t go hungry, but you may experience some gluten envy just like me. 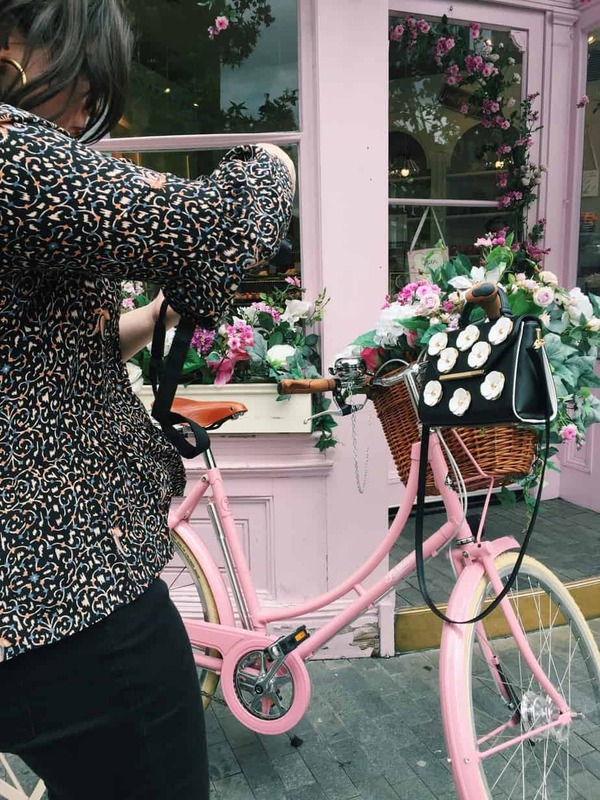 Luckily, the whole place is just sickeningly charming so you can easily distract yourself with finding the perfect instagram! As we went so early in the morning, we were the only customers for a while. 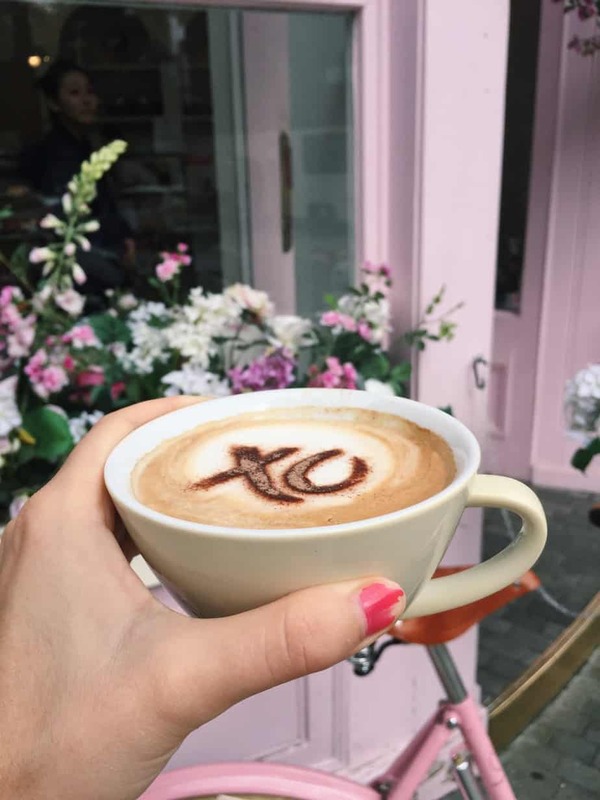 We got the best table outside, and snapped lots of pics without feeling too #basic etc. as not that many people were around. 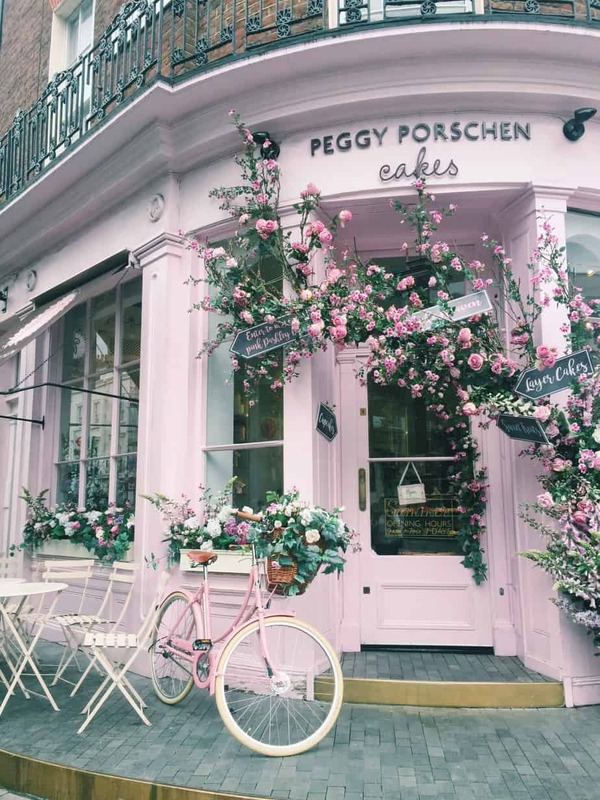 I can definitely see Peggy Porschen getting crazy crowded in the afternoon. 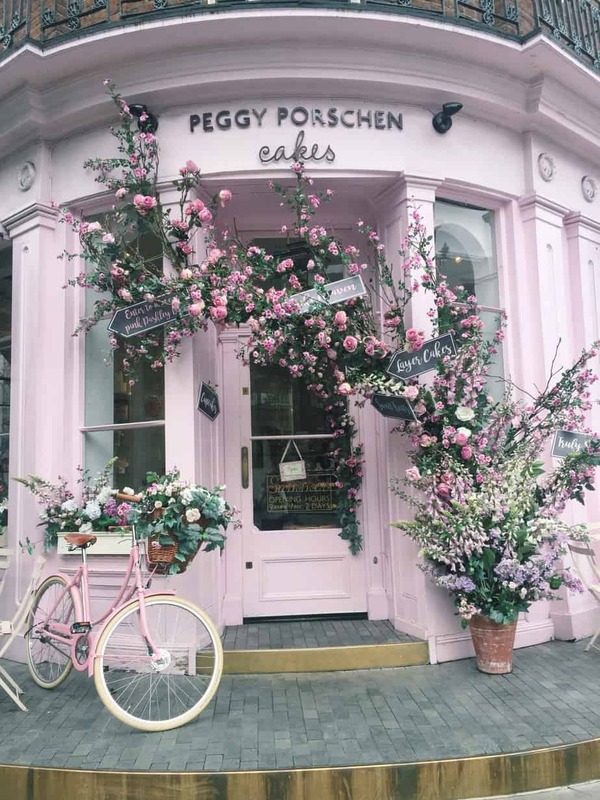 So do I recommend a visit to Peggy Porschen for the gluten free London visitor? Well, yes and no. 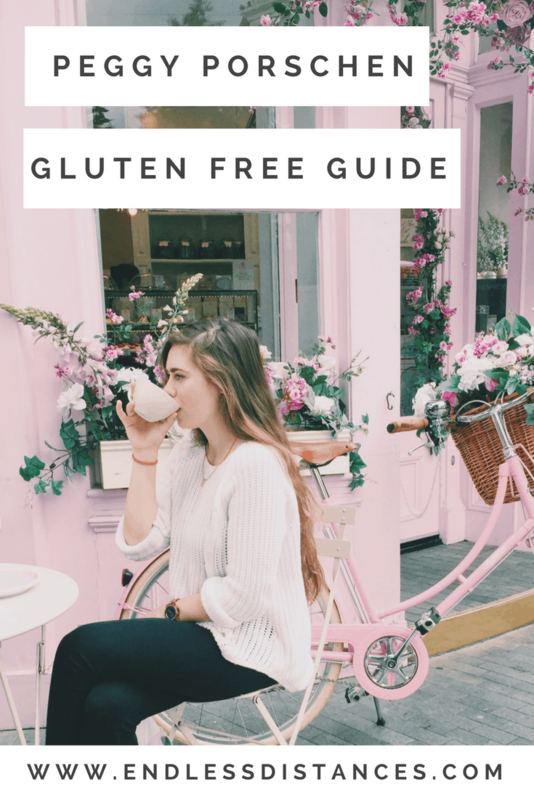 If you are solely looking for the gluten free cake experience, you can find it here but you may be sad about the lack of options. 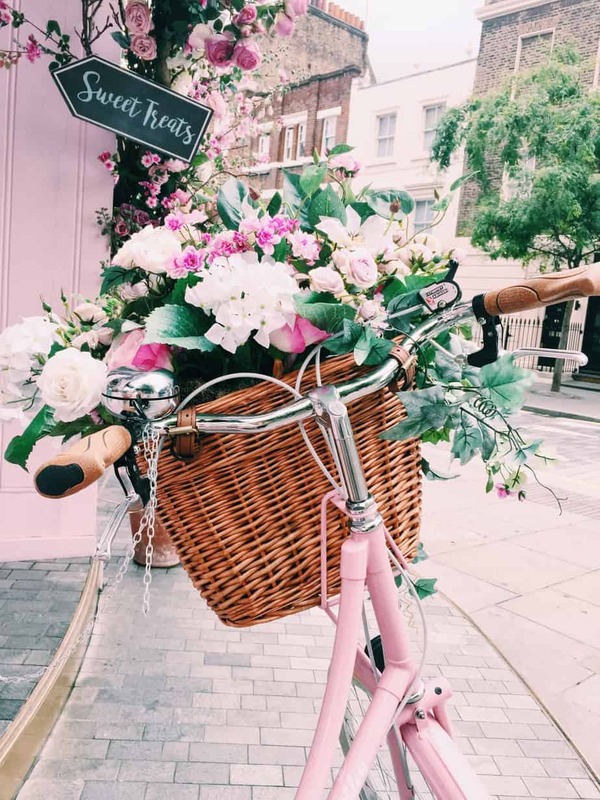 However, the pure pinkness is truly a sight to behold, so if you want to revel in the cute-ness and snap some photos, then I would say it is definitely worth it. 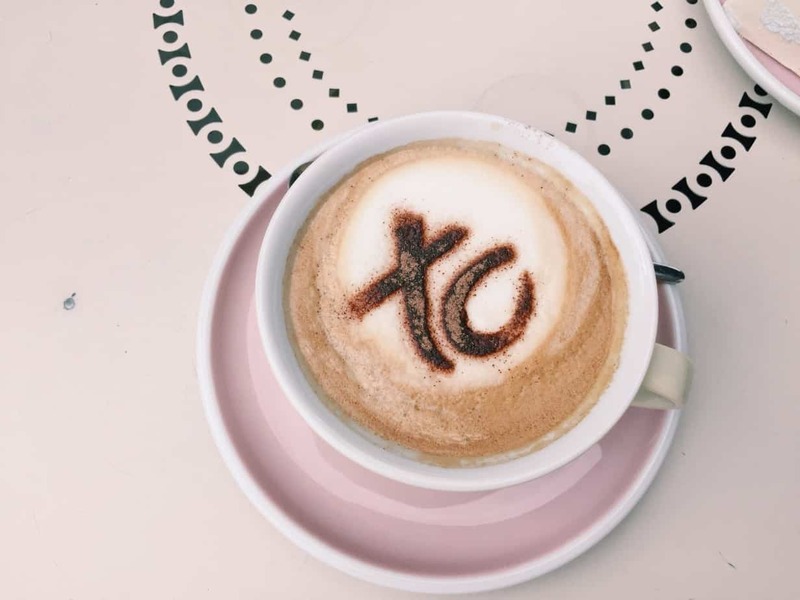 We really enjoyed our coffee and cake and photo ops. This is not a sponsored post, I just love cake. 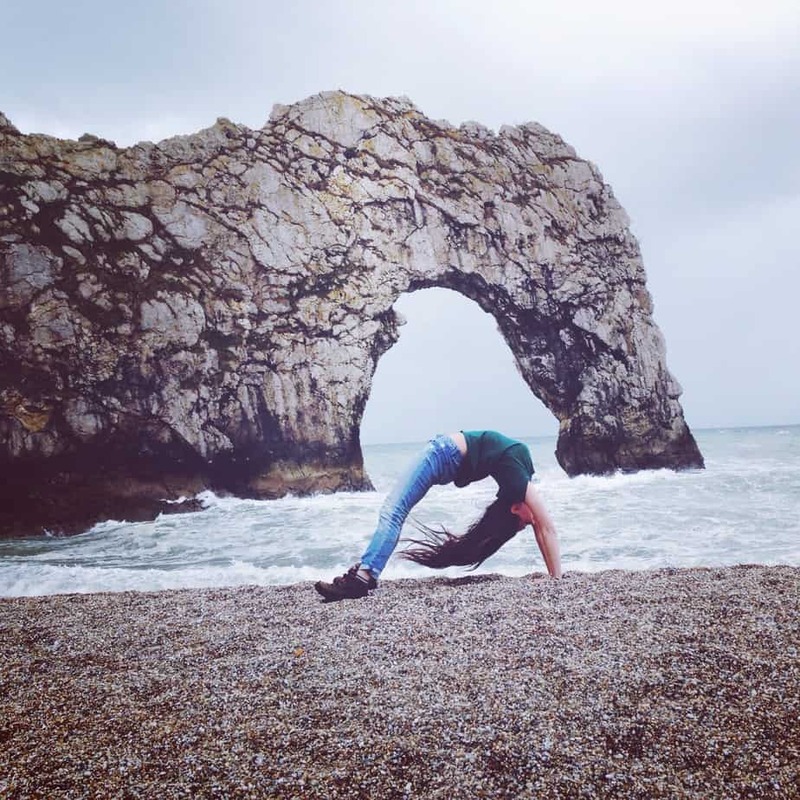 I am linking up with Lauren of Lauren on Location, Van of Snow in Tromso, Isabel of The Sunny Side of This, and Marcella of What a Wonderful World for Wanderful Wednesday.